Last weekend I stayed at my boyfriend Will's and after his friend's 21st birthday on Saturday night, we were feeling quite fragile and knew just what we needed - good food. We often joke that all our dates are based around food and how we get too excited about going out for meals, but what I can I say? We're two keen little foodies and truly appreciate proper grub. I recently saw a quote that made me laugh - "be with someone who gives you the same feeling that you get when you see your food coming in a restaurant" - and after seeing countless bloggers' uploading snaps of this place to Instagram, I thought that we may well get that feeling if we went... and we totally, completely did. Homeslice - fantastic name, for starters! - is a pizza joint that can be found in the charming location of Neal's Yard, offering handmade wood-fired circles of sweet doughy goodness served either as whole 20" pizzas or by the slice. On our arrival it was plain to see that this place is extremely popular, as inside was a hub of laughter and the queue to get a table had spilled out onto the street - a sight that fills you both with panic that you may not be able to eat there and reassurance that whatever they're doing here, they're doing very well. Luckily the manager told us that we were welcome to order a drink and wait until a table became available which we happily did, and after twenty minutes - which was spent undergoing some serious discussion over which toppings to go for - we were able to take our seats. As far as decor goes the interior is utterly beautiful; all rustic wooden furniture, crystal chandeliers and a huge wood-fire, which throws out the most amazing smells. The table we were seated at was shared and communal, which was lovely as we were able to chat to the people on either side of us yet had more than enough space for ourselves. We were amazed by these huge green wine bottles that were scattered around the restaurant, and couldn't work out how in the world tables of two were going to drink a bottle of red that looked as if it had at least two 'normal' bottles inside it - until the couple next to us asked for their bill and the waitress measured their supersized bottle to see how much she should charge them, based on how much they had drank. Very cool idea! We (of course!) went for the 20" pizza and chose the 50/50 option, opting for half 'chorizo, corn & coriander (C)' and half 'mushroom, ricotta & pumpkin seed (G)' - see the rest of their current menu here. I overheard the waiter explaining the letters to another table and I'm pretty sure that the (C) means 'chilli base' and the (G) means 'garlic base'. Regardless, whatever they put on that they were positively gorgeous - literally the best pizza I have ever had in my entire life. Underlined for maximum emphasis! Seriously, I had high expectations anyway but the food was ten times better than I thought it would be and we'll without a doubt be back to try some of their other toppings - I've got my eye on the 'calabrian peppers, chervil & Lincolnshire poacher' on (T), a tomato base. Just so, sooo good! Priced at £20 per pizza some may find the expense a little steep, but taking into consideration the fact that it's situated in Covent Garden, that they use the best seasonal produce, how friendly and helpful the staff are and simply how freakin' good the food was, I think it's entirely reasonable and would pay that price again. We highly recommend it! 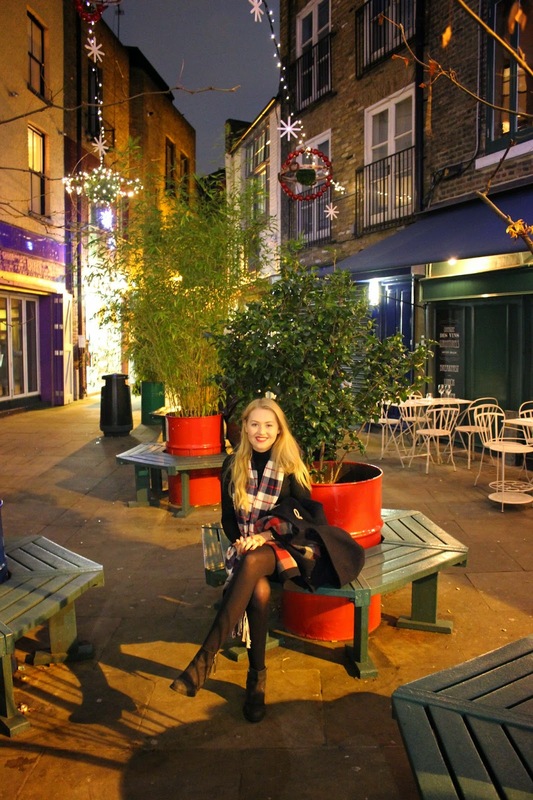 The setting makes the whole experience of dining at Homeslice even more special, as it's located in the heart of Seven Dials and you're able to stroll through the alley and courtyard of Neal's Yard, which currently looks so pretty and festive thanks to the time of year. Have you ever been to Homeslice? Where are your favourite places to eat in London? yummm that looks so delicious! I've heard of the place before, but seeing that pizza has confirmed it - i neeeeeed to go! I want to go to Homeslice sooooo bad, the toppings look insane! Aw this looks so lovely!